Already rolling their way through the 2010 NCAA Tournament, No. 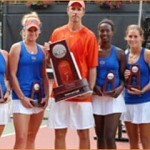 3 Florida Gators women’s tennis (29-2) swept the No. 2 North Carolina Tar Heels (30-5) 4-0 in the event’s semifinals on Monday at Dan Magill Tennis Complex in Athens, GA. 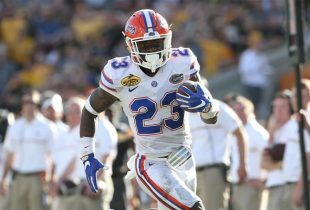 The Gators’ top three players – freshmen No. 8 Allie Will, freshman No. 9 Lauren Embree and senior No. 65 Marrit Boonstra – all won their singles contests (in reverse order). Boonstra triumphed 6-2, 6-2; Will won 6-3, 6-3; and Embree’s match went three sets ending 6-2, 1-6, 7-5. In doubles competition, the No. 5 team of Boonstra and Will led 6-3 in a shortened match after the No. 29 duo of Embree and sophomore Joanna Mather prevailed 8-4 and the combination of freshman Caroline Hitimana and senior Anastasia Revzina ran through their competition 8-1. Also still playing at the event’s conclusion were No. 102 Revzina (tied 4-6, 6-5, 3-3), Mather (up 6-2, 3-6, 4-3) and sophomore Claire Bartlett (down 5-7, 2-2). Florida will face No. 8 Stanford (25-1), which defeated No. 5 Notre Dame 4-1 in the other semifinal, on Tuesday at 2 p.m. in the championship match live on ESPNU. The Gators beat the Cardinal 4-3 for the 2003 title but lost 4-0 the last time the two teams squared off in the 2006 semifinals Should Florida prevail, it will be the program’s fifth National Championship and first since 2003. Stanford is the sport’s most storied college program, having won 15 of 28 titles.